The Waltons Honeypot Bluebell Wooden Playhouse is one of the most interesting and affordable child playhouses we have seen in quite some time. The look of this is just so impressive and unique and that is because of that blue cladding and those large Georgian style windows. 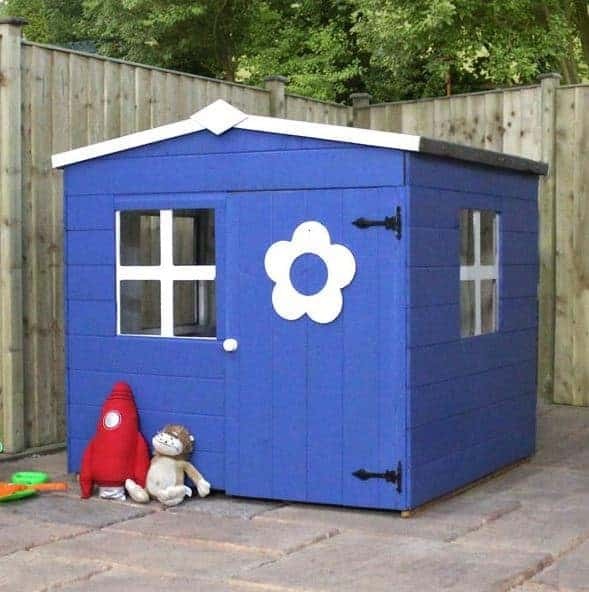 There is just so much charm with this playhouse such as the flower decoration on the door and the interestingly shaped apex roof. Installing this in your garden will give the kids a great reason to turn off Disney XD, put down the Nintendo 3DS and use their imagination to have some fun outside on their own, with their little friends or even with their best stuffed teddy friend. Even though Waltons have managed to offer this at a low price, high quality materials have still been used in the constriction of the playhouse. The frame that keeps it all together is a very solid 28 mm x 28 mm that also has double framing at the corners. This makes the whole structure incredibly strong. Even that gorgeous blue tongue and groove shiplap cladding is a respectable 12 mm thick. Even though this is one robust playhouse it is still child friendly thanks to the child friendly features such as the door having a gap so there is no trapped fingers and the shatterproof styrene windows. 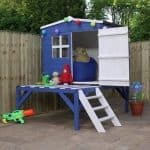 Waltons have been just blowing us away with their line of low cost, high quality playhouses and the 4 x 4 Waltons Honeypot Bluebell Wooden Playhouse is another fantastic entry into that line. At 4 x 4 this is a good enough size that it offers plenty of room to play for the kids, but at the same time mum and dad will be happy that the playhouse is not taking over the whole garden. The 4 feet of width and depth gives the children a lot of floor space to keep toys, have a table, play and do whatever pops into their imagination. We are sure that you will have just as much fun watching them play as they do playing. The height is 3 feet 8 at the highest point and then 3 3 feet 5 inches at the eaves this is not the highest playhouse we have seen from Waltons, but to a child this is more than high enough. To help keep the costs down, but not affect the quality, Waltons have used 8 mm thick, solid sheet boarding for the roof. We like this as it is more than strong enough to handle a lot of snow if we get a bad winter and the sand felt the cover the boarding is going to keep them free from rot. While this is an apex roof if it has a very shallow peak which we actually really like the look of as it makes this playhouse a little different from the rest. 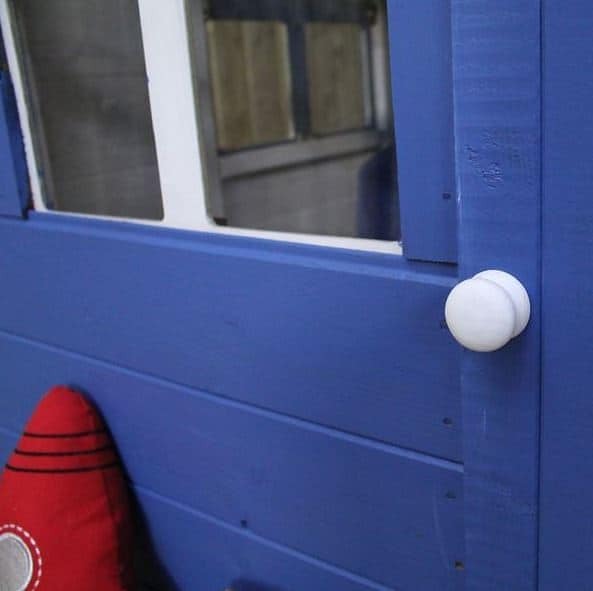 We have seen this same 12 mm thick tongue and groove shiplap cladding on many other playhouses from Waltons, but this one has an edge over the others as it is of course blue. It looks just so charming and it does give the playhouse a whole lot of personality. While it looks very nice, we must tell you that this cladding is slotted together so well that there is no way any rain is getting through it. To make sure that the playhouse is still standing after a very wild teddy bear tea party or after some big showdown with Batman and Superman, Waltons have made sure to give this a solid frame. At 28 mm x 28 mm the frame certainly does make this one very robust structure a huge part of what makes this frame so good is the corners of the playhouse are double framed which greatly enhances the overall strength. The flooring is made with similar boarding that the roof is, but here it is an extra 2 mm thicker at 10 mm. The 10 mm thick solid sheet boarding enables the kids to jump around like crazy and also put many items inside with the floor easily being able to take it. The fact that they have made this a little thicker than the roof is quite surprising considering the price of the playhouse. 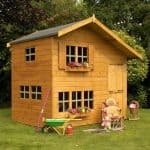 The 4 x 4 Waltons Honeypot Bluebell Wooden Playhouse is one of the most attractive looking playhouses we have seen in quite some time and to keep that wood looking great you will need to give it a coating of wood treatment once you have installed it. A fresh coating once a year will keep that wood looking amazing. Whatever you do, do not keep putting off treating the playhouse to the following weekend as by the time you do come to treat it, it could be too late and rot could have started. 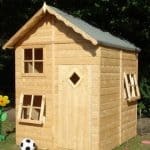 A ten year warranty is included with this playhouse, but this is dependent on you treating the wood. As long as you do this then you are covered against rot for ten years. At 2 feet 11 inches high and 1 foot 9 inches high, getting in large stuffed animals huge action hero playsets and their other favourite toys is going to be easy. The door is very well made and thanks to there being a gap around it, your kids will not be able to trap their fingers in the door. This door also have a very good sized door knob on it to make opening it not require them to use their fingers round the edges. Those large black hinges are going to be able to take many, many slams and make sure the door does not come loose. To really make the door pop and be a standout feature there is a really adorable flower decoration on it. 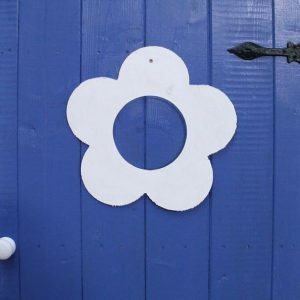 We have seen other playhouses with this same style door, but they have a window in the flower and we wish they had put that on here too. Located on the front of the playhouse is a Georgian style window. There is one also on each side and these have been made with shatter proof styrene that is 2 mm thick. Even though they will not mean to, the kids are going to give those windows a bit of abuse over the years, but at least there is no worry about broken glass being in the playhouse. The door is a secure door, but there is no way included to lock it. Now before you go rushing down to poundworld to buy a padlock just think that you will be the one who has to lock and unlock it each time the kids want to play. So a lack of a locking mechanism is not actually something we would class as a huge negative. Just be sure not to allow them to leave more expensive things inside here. This is not a playhouse that is going to completely seal the kids off from the outside world as there are three windows. This is a good thing though as you will be able to watch them having fun and also you will be able to keep an eye on them and make sure they are not hosting a teddy bear tea party with your best plates, cups and expensive food from the fridge. 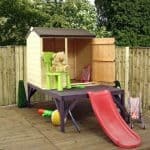 Waltons do not have any customisation options with this playhouse, but as you need to treat the wood anyway you can decide between making it have a dark or light look. Inside the playhouse we feel that it is best to let the kids run wild and let them customise the layout. We are not saying let them loose with the power tools, but let them decide where things go. There are a few optional extras available with the playhouse. The roofing felt can be upgraded to a 10 mm superior felt. This is available in, charcoal which costs, £34.95 and also olive green which for some odd reason is double the price at, £69.95. If you are not too sure about the ground you will be installing this then there is a portabase available for, £59.95. 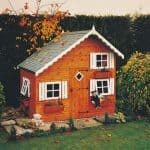 Last of all we have their installation service which is nearly as much as the playhouse itself at, £109.95. We would recommend building this yourself than paying that kind of price for an installation service. Just because this is a low priced playhouse does not mean that it is poorly made with cheap materials. Quite the opposite, Waltons have made sure strong and high quality materials have been used. This playhouse has been designed to take the rough and tumble that kids love to do and because of this the materials selected will last many years. While for adults 4 x 4 may seem small for children this is plenty of room. We just wish they used a higher roof as while it looks great, it is a few inches lower than a traditional apex roof. 3-5 hours is what a playhouse of this size normally takes the average person so get a friend to help, follow the included instructions and you will be surprised at how easy this is. 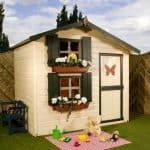 This is a good sized playhouse that is made with high quality materials and it costs under, £150. You will not be surprised to hear that we think this is one incredible deal. Final Thoughts: The 4 x Waltons Honeypot Bluebell Wooden Playhouse is certainly one of the most interesting looking playhouses from Waltons. It has a very interesting style, a different type of apex roof and just an all round charming design that the kids are going to fall in love with as soon as they see it. We love the floor space it offers and while we do wish it had a little more headroom, we are sure the kids will not care. 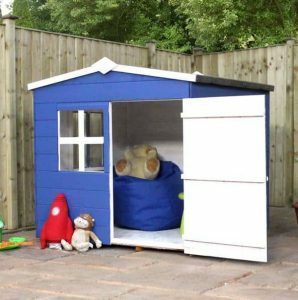 We have seen plastic playhouses that cost far more than this so at £139.95 and with how well made it is, this is something that is very easy for us to recommend.